For the final day of the “1 new thing a day challenge,” I went to the Chicago Air and Water Show for the first time. 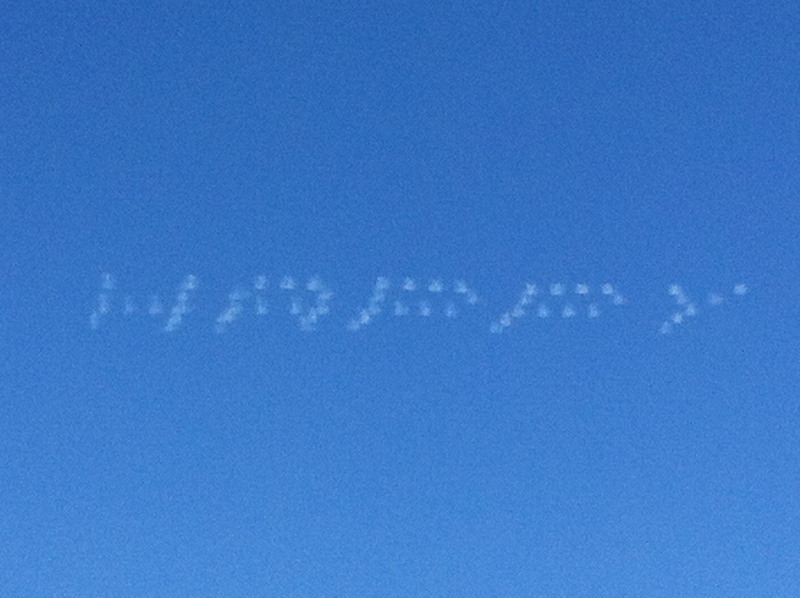 This picture is courtesy of a fleet of skywriters. Human minds always have a “fall back.” The mind’s “fall back” is a pattern that it is used to, that has become habitual. For example, I would say that my mind’s “fall back” is worry. When something happens, whether it is an undesirable situation or an experience that cannot be understood, my mind will fall back into the worry pattern. It comes up with scenarios of increasingly disturbing outcomes. We worry over all kinds of things. If you can’t get the right nail polish color, you worry. Everything causes worry. You don’t have to have a crash in the stock market or some other financial crisis to make you miserable. Just one little pimple is enough to cause you to go into a tailspin—as if nobody has ever had it or it’s going to be there permanently. There seems to be so much stress in modern life: ‘I have to do this. I have to do that.’ Yes, you may have responsibilities, but the first and foremost responsibility is to take care of you. If you can’t take care of yourself, how can you take care of others? So, have faith and confidence: ‘I’m going to change the situation. I have the strength to face and overcome anything.’ Worry never helps anyone. The email was from the Satchidananda Ashram which sends out “Weekly Words of Wisdom.” This one arrived right on time. The feelings of worry were transmuted into peace; the sign I received was sufficient to break my rapt attention on a mind in the midst of a worry cycle. What is your “fall back?” Next time you notice the mind reverting to its habitual thinking patterns try asking a question. You can even just ask for help. While no one knows how the questions will be answered, it will be interesting to watch and find out.